What she lost — social life and sports — she made up for in academic achievement and was named the 2013 Robert L. Hill Distinguished Senior Award recipient, which is given to a senior in the top 2% of the class who has pursued a rigorous academic curriculum while being involved with campus and community projects. Carrie’s stellar academic record and proven work ethic have already landed her a job as an emergency room nurse at Centra Southside Community Hospital in Farmville, Va., where she just finished 160 hours of clinical work. She has happily accepted the job, pending passage of state boards. She no doubt impressed the hospital with her determination to complete her clinicals during her last semester. She had to delay them because she tore a rotator cuff and labrum when lifting a patient in the fall semester, a tear she said was inevitable because of damage from years of playing softball. Carrie wasn’t sure she would be able to finish her six-class load and work 12-hour shifts Thursdays, Saturdays, and Sundays in Farmville, but she did. A native of Martinsville, Va., Carrie initially wanted to stay at home and attend community college, but was persuaded to check out LC by her cousin, Stephanie Brinegar Vipperman ’02, who perhaps not surprisingly, was the 2002 Hill Distinguished Senior. Carrie came to campus in the pouring rain and fell in love. Carrie’s list of achievements before attending college was already impressive: she is an EMT (emergency medical technician) and firefighter at her local fire station in Martinsville, where her father, Thomas Martin, was recently named chief and firefighter of the year (the latter because Carrie nominated him). Her interest in nursing stems from being her mom’s nurse since she was 10 years old, when her mother, Paulette Martin, was diagnosed with scleroderma, or hardening of the connective tissues. Carrie said her fiancé J.D. Tyree, also a native of Martinsville, accuses of her being an adrenalin junkie, and she admits to liking trauma, not for what it does to people and families, but for “the challenge it poses.” She likes to figure out what needs to be done first when someone has been injured. At LC, she has been a mentor to many of her fellow nursing students. She has served as a PASS leader since her freshman year, tutoring students in chemistry and biology. She currently works in the new nursing lab where she helps students with prerequisite or nursing courses. In addition to her nursing major, she has minors in biology and health promotion. As a member of Kappa Delta Sorority, she has held many leadership positions and has been actively involved with Girl Scout troops in the surrounding Lynchburg community, helping instill confidence in young girls. “The Greek community has been really important and has made me grow as a leader, a student, and a person,” she said. 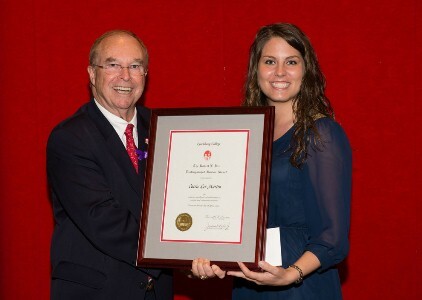 Carrie has made the Dean’s List each semester and is a member of Phi Eta Sigma, Phi Kappa Phi, Omicron Delta Kappa, Order of Omega National Honor Societies, and Sigma Theta Tau International Nursing Honor Society. Her ultimate goal is to attain her master’s in nursing and become a college professor. In the meantime, she wants to be the best nurse she can be.